While the world dreams of grand but outrageous visions of waking up to the feel of gentle waves while living out of a modern, urban floating city, we have our feet stuck firmly on the ground. The closest we are to the living on the sea is through homes overlooking it. But these pockets of wonders that let you soak in the sights and sounds of mighty Arabian Sea are more than enough. They are the very definition of luxury and serene existence giving glimpses of crashing waves, diamond waters, and pleasing whiffs of coastal air as you move from room to room. Yet, as magnificent as the sunset visions maybe, as breathtaking as the panoramas possibly be; the sea can create havoc on most abodes. So, today, we take a look at what it takes to live just inches from the sea coast. Before we talk about how you can design and maintain a sea-facing home, it is important to address one important point - sea-facing homes are not the same as sea-view homes! Let’s get that sorted first! Sea-Facing or Sea-View – How To Differentiate Between The Two? Planning and maintaining a flat that is almost perched on sand is very different from one that is sitting a cosy distance away. One is a sea-facing home, and the other is a sea-view home. The latter is further away from the sea and therefore costs less. Because they are not bound to the coastline, they are more practical but offer a vista of the waters only from some corners of the apartment. A sea-facing home, on the other hand, is one situated adjacent to the sea. The prime location adds a premium to the price tag but, they are worth every penny just for the mesmerising seascape! We veer off sea-view apartments and keep the focus on designing and maintaining the ones that face the ocean. Here Are The Cons Of A Sea-Facing Home! Nothing in the world is perfect. It deflects just slightly, every single time. It is why we tend to find a pinch of salt even in the sweetest of things. Ergo, it shouldn’t come as a surprise that for every beauty a sea-facing apartment affords you there is an equally tormenting reality, a pro for every con. Postcard worthy sunsets through your windows equate to window panes that must be thick and shatterproof. A private beach to walk-on connected to the backyard means extra care of landscaping, floorboards and outdoor furniture. The smell of sea air first thing in the morning implies a home a full of humid air that slowly corrodes wires and lessens the shelf-life of appliances. The calming sense of briny air is ruined by the mold that seems to crop up everywhere. The romance of wind blowing through French windows is spoilt by the rust that piles on electric switches. Love metal furniture? Yeah, you might want to rethink that! Corrosion can ruin it. It is ideal to opt for stainless steel, fiberglass, or vinyl instead! Pithily put, sitting cheek to jowl with every indulgence is upkeep that demands time, attention and moolah when it comes to sea facing homes. That said, the perks of living in an apartment facing the sea outweigh its maintenance, by far. With simple tricks and design schemes, a home can be protected from the fickle sea. 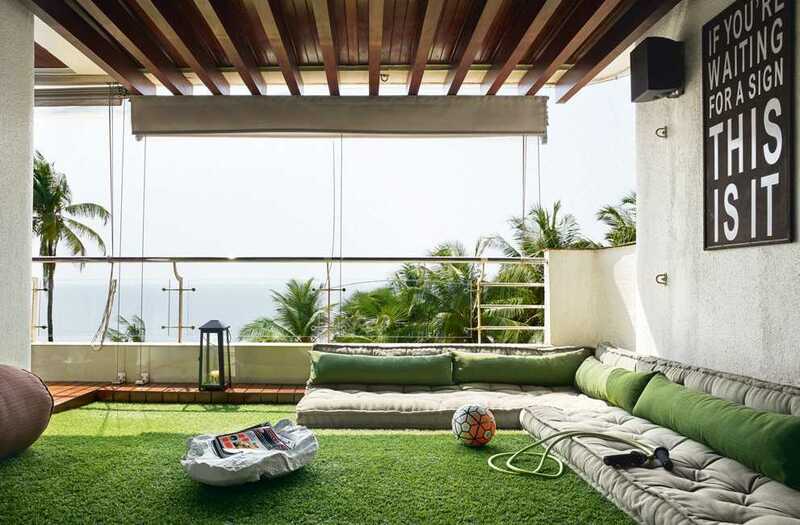 Some of the ideal sea-facing homes we can look to for design ideas are the ones owned by our beloved Bollywood celebrities! Here are a few homes we can take inspiration from. Design Your Sea-Facing Home Taking Inspiration From These Celebrity Masterpieces! 1. Hrithik Roshan’s Sea-Facing Gem! What’s the biggest draw of a residence that opens up to the Arabian Sea? The vista; and Hrithik’s bachelor abode utilises every iota of it. When the well of inspiration run dries, look no further than the actor’s billiards room. A massive table, sophisticatedly lit up, is juxtaposed with the deep waters of the sea. The idea is to pick statement pieces that demand their own attention but don’t take the eye away from spectacular views. For a truly indulgent feel, copy the all-white hue of the room and let natural sunlight balance out the warmth. Another room in the dwelling that makes for an excellent blueprint is the balcony. A burst of green mixed with striking wooden ceiling creates a heavenly alcove to kick back with a cooling cup of Oolong or iced coffee. Modern, warm and surprisingly spacious are the words that come to mind when you see the actor and animal lover’s home. The duplex is a quintessential example of how to integrate indoor spaces with outdoors seamlessly. Given the constant lack of space in the city, the open plan not only expands the sense of area but also leverages the seascape. Add in floor-to-ceiling windows to maximise the view, light and breezing air. A garden terrace with laid back seating entices even the most sedentary person to step out. What happens when the lady of the house is an interior designer? Your home facing the Arabian Sea becomes an oasis in the middle of the biggest metropolis in the country. The household of actor Akshay Kumar and hilarious author Twinkle Khanna is the perfect muse for anyone. 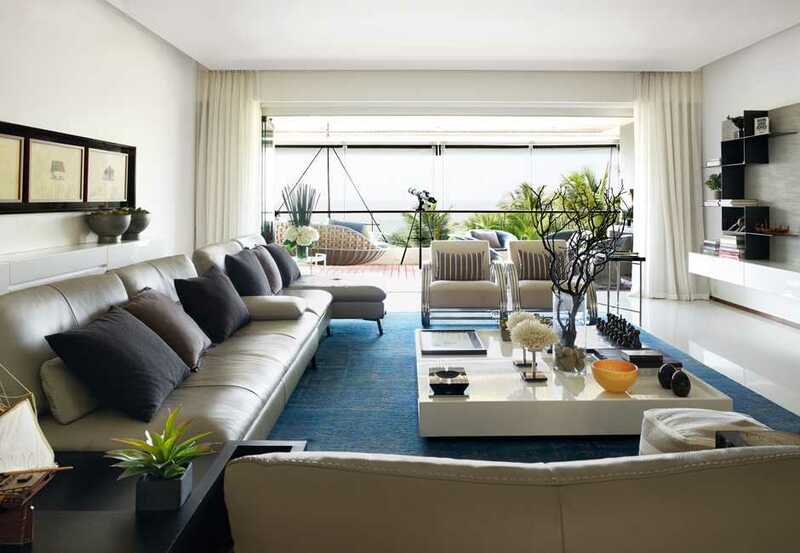 Strategically place the furniture so that it faces sections that look down to the sea. Balconies are not just for outdoor furniture; a comfortable daybed works just as well. Since the salty air is going to ruin any patio, deck and balcony gear, choose a distressed and unfinished look. Discovering the interiors of Shahid Kapoor’s Juhu home through Instagram belabours that the very essence of lavish living is moderation. A sanctuary rather than a museum, their home can be a template for any sea-facing property. The décor has mastered the fact that a house is not art you admire but a comfortable shirt you wish to wear. Make the side facing the sea a retreat. For the Kapoor’s it’s their backyard, and it is precisely what a dream oceanfront property should look like. The wooden décor brings in a natural factor which doesn’t require maintenance. The deep-set seating area and ledges along the boundary add a modern effect. For lazy evenings and dinners over sunset, set aside an area with high chairs and tables. Or opt for faux-metal round stools as a classic option for potential outdoor parties. Two-tone pairing works like magic. Black and white are the hues that stand out with plush sofas to offset the perspective. Accent the living room with large mirrors to amplify natural light and make the area look bigger. Throw some bold tones on cushions for a touch of polarity. The allure of a sea-front address lies in its utter simplicity. Crowding it with knick-knacks chips off its exquisiteness and makes it harder to maintain. The craft of managing a home that overlooks waving waters is to keep it natural. The idea is to sway towards minimalistic and classy décor. Believe us; it will be a lot easier on upkeep, too! To avoid the home from becoming a sad repository of everything irreparable and unwanted, stick to these tricks. Starting from the outside-in, pick an organic exterior finish. Stone and concrete are the best choices because they can weather the vagaries of the sea. If your heart is set on wood, then take a leaf out of Twinkle Khanna’s home and use an aged finished. It will not need re-staining as frequently as others. But if you just can’t do without paint, then pick an oil-based one of superior quality. The salt in sea air plays more than havoc on regular paint. You do not want painters climbing up and down, every three months, to get rid of peeling stains. One thing common to every house close to the sea is humidity. It seeps into every nook and cranny. The only pervasive way to get rid of it? Dehumidifiers. Think of them as the Thelma to your Louise. You need them to get rid of moisture in the air that makes the household a breeding ground for mould and mildew. The other recurrent element in dwellings that open up to the ocean is personal decks or balconies. As much as they are a boon, they are a bane. Constant care and clean-up are indispensable, but with the right furniture, it can be scaled down. Invest in cloth covers and removable cushions. Metal in all its regalia turns even the most spartan of homes regal. Unfortunately, those who live in sea-facing abodes need to give it a hard pass because the salt in the air corrodes it rather quickly. When it comes to living spaces in Mumbai, the sea is, without doubt, the last frontier. Swanky digs that afford uninhibited experiences of the north-western arm of the Indian Ocean is every person’s dream who calls it theirs. Waking up to the calming hum of waves lapping or seeping in the subtly varying hues of the water not just day-after-day but season after season is unparalleled. But to ensure that the dream doesn’t morph into a nightmare marred with harsh realities, you need to take prerequisite precaution both while designing and maintaining it! It takes a balancing act to interior design a sea-facing property. Let us take the headache, while you worry about walking on talcum sands. Get in touch with Hipcouch for a drool-worthy sea-facing abode! Newer PostThings To Remember While Renovating An Old Construction In Mumbai! Older Post7 'Unusual' Tile Patterns That Can Make Your Home Unusually Awesome!